A useful flowering groundcover, or provide a structure for it to scramble up, such as a trellis, fence, or stump. Also nice in borders and cottage gardens. Space about 6-10" apart if providing support, or 2-3' apart if not. Diseases & Pests: If slugs are troublesome, sprinkle some diatomaceous earth, crushed eggshells, or iron phosphate pellets on the ground around the base of the plant. Aphids can be a nuisance; hose plants down daily until the pests are gone, or apply an insecticidal soap. Avoid powdery mildew and leaf spot with proper spacing in a location that has good air circulation. A preventive organic fungicide can be used. 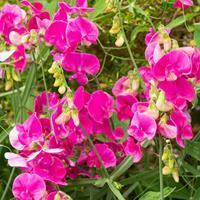 Flowering: Showy 1" wide light pink pea-like flowers.